CWD is a strange disease. It incubates inside infected deer, elk or moose for years before symptoms show up. The disease is carried by prions, an infectious protein that attacks the brain, which cause infected animals to lose their appetite. As they slowly starve, they begin to display weird behaviors: pacing, walking with their heads lowered, drooling and stumbling. Because CWD takes so long to manifest itself, it’s difficult to manage. 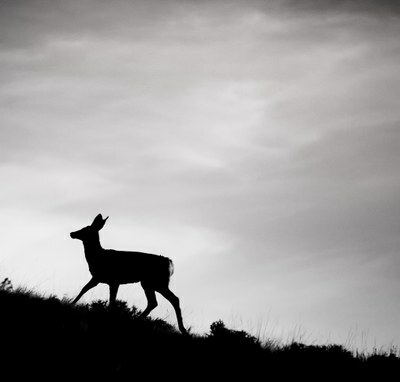 The state of Wisconsin took an especially aggressive approach and tried to kill off most of its infected deer, creating longer hunting seasons and requiring hunters to kill a doe before shooting a buck, but the disease still spread. That’s because prions persist for years in the environment, says Johnson. They build up, and even amplify, in soil, infecting deer, elk and moose as they graze, and may even be taken up by the plants themselves. They linger in the feces and bodily fluids of infected animals and inside their carcasses after they die. Researchers are now studying whether other animals that eat the dead deer, like mice or voles, can get sick, too. The most recent state to discover infected deer was Pennsylvania. Last March, according to The Altoona Mirror, hunters turned a middle school auditorium “into a sea of camouflage” during a presentation from the state’s Game Commission about how to manage CWD. "There is no place where this disease has ever occurred that it has been stopped," said Walt Cottrell, a veterinarian for the Pennsylvania Game Commission. "There are two things the disease does when it arrives: It gets worse, and it spreads." Photo courtesy Greg Westfall via Flickr creative commons.